Aichi Steel was founded by Kiichiro Toyoda in 1940 with his passion that "Great cars are made with great steel". Since then, as the only material manufacturer of the Toyota Automotive Group, we have consistently provided high quality materials. Even today, we inherit the vision of research and creativity, and have evolved our mission from "Great cars are made with great steel" to "A great society comes from great materials", providing a wide range of materials to the world beyond specialty steel and forgings that contribute to many products used in our daily lives, starting with automotive and covering industrial machinery, construction, IT, electronics, medical and agricultural fields. Many latent risks surround us such as the rapidly changing financial environment of the global stage and the powerful impact of natural phenomena. Standing against these challenges we lay a firm financial foundation, uncover new business potential that prepare us for worldwide changes and seek to grow to even higher heights. Our material recycling production processes take scrap metals and create new products in the form of specialty steel and forgings and contribute to society. In order to be a company needed by the wider public, we have established the "Aichi Way". It evolves our corporate governance to an even higher level by consolidating the "Aichi Spirit" and "1S Culture" ("1S" means Seiso (Cleanliness) 1st, Shojiki (Sincerity) 1st, and Safety 1st) we have been promoting so far. By honestly implementing the new Aichi Way, we will increase our sense of unity as a company and fulfil our societal responsibility. Our desire is to contribute to the pursuit of a prosperous future and the implementation of a sustainable society and earth through creating unique technologies as part of healthy corporate activities so that people will say of us that "Using Aichi Steel Group's products makes us feel safe and secure around the world". In 2020 we will celebrate our 80th anniversary. 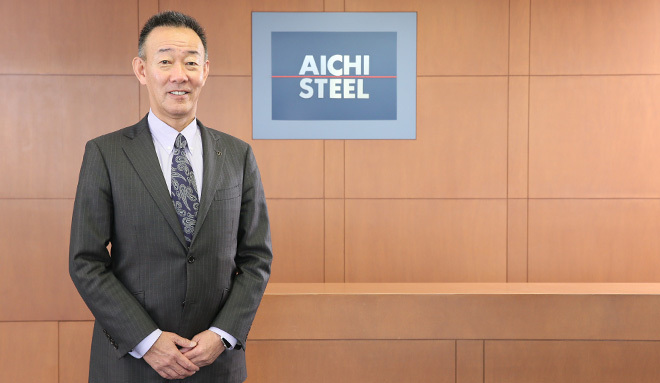 In order to continue to respond to the expectations of our various stakeholders, including customers, shareholders and the regions we work in, the Aichi Steel Group works towards growth that layers on each year as in the annual growth rings of a tree, achieving our 2020 vision and taking on the challenge of becoming a Company of Choice Globally.